School Friends, Pretty shoes, New Look, Vlogging, Dior Amber Diamond Highlight, Bed hair, Lemonade, Pink Sands Yankee Candle, YouTube, Bio Oil, Avene skincare, Tiny Tower, iMovie, Editing photos, pretty sandals, Peartiser, mild weather, Granny Smith cocktails. I’ve had a great week. Nothing in particular to report, nothing ground breaking, just a really good week spent relaxing and spending time with family and friends. I became addicted to a couple of iPhone games; Temple Run and Tiny Tower and I also discovered some great cheap apps; Colour Splash which is a app that allows you to edit photos so that the whole picture is grey but with some features in colour, very cool, and iMovie which is great for making on the go vlogs and uploading them fairly quickly to YouTube. This will definitely encourage me to upload more as it is so much easier than faffing on with my camcorder. 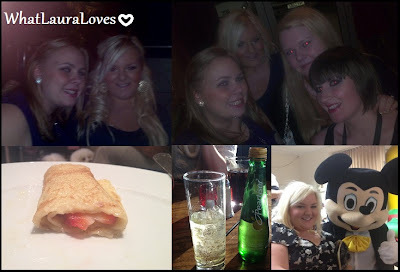 Pancake Day was awesome this year as sad as that sounds! I haven’t had pancakes for years as I’ve never really been too keen on them. This year, I really fancied them though and wanted to try them again after all these years. I had mine with strawberries and Golden Syrup and they were delicious! What did you have in yours? If you look closely in the photo above, you can see Daisy May trying to greed some pancake off Mr WLL! Naughty but so cute! On Thursday I went to a spa and had a manicure, pedicure and an omnilux and microdermabrasion facial as well as another treatment which I’m not too sure if ill talk about on WhatLauraLoves… and on Friday I went out for lunch with my friend to a wine bar and restaurant along the sea front. I also popped into New Look and bought some more shoes and jewellery so expect another New Look haul coming up this week. On Saturday night I went out for an Indian meal with a few of my friends that I went to school with and then we went out for a few drinks in town, it was lovely to see them. Speaking of New Look hauls, I posted this WhatLauraBought New Look Haul earlier on this week. I blogged about two great skincare companies this week too; Decleor and Avene. I’ve used the Decleor Cleansing Milk and Tonifying Lotion for years and really recommend it for those looking for something gentle and non offensive; its great for those with sensitive skin. For those with really dry skin, I’d recommend reading my review of the Avene Extremely Rich Compensating Cream as it would be perfect for your skin type. On Friday, I tried my hand at vlogging and filmed my first ever ‘follow me around’ style vlog. I also posted a WhatLauraWore post of the outfit I wore in the vlog. Thank you all for such a lovely response on YouTube and my Twitter, I really appreciate it. I must admit I did feel a little silly talking to myself, especially when out in public, but I am getting used to it and have filmed another that I’ll be uploading tonight. I started vlogging in response to some requests on Twitter, so if there’s any other blog posts or Youtube videos that you’d like to request, please let me know either in the comments, on Twitter or by emailing me at whatlauraloves@gmail.com and I’ll get round to them as soon as I can!